So you want to buy a puppy, and your thinking you want a Rottweiler? There are a few things to consider when buying a puppy in general, and specifically bringing a Rottweiler into your home. Step 1 – First, ask your self some questions: Why do I want a dog? Do I want a companion to hang out with and do some ‘human” things with like camping or family outtings? Am I looking for a pet for myself? A companion to hang out with, snooze on the couch, cuddle on cold days. Do I want the family dog? A dog that my kids can play with, walk by themselves, or just hang out with them? Am I looking for a partner to do sports with like Schutzhund, obedience trials, showing? Am I interested in breeding dogs? Understanding what you want to do with a dog, and how much time you want to put into that relationship, will help you to determine the breed of dog, male or female, adopt a rescue dog or purchase a puppy. Some dogs need more daily care than others. If you only have a few hours before work and a few hours in the evening, you don’t want to have a dog that requires constant interaction, grooming, excercise. All dogs require involvement though, so you should not consider getting a pet if you cannot spend time every day with your dog. Step 2 – Do your research. Sporting Group – Naturally active and alert, Sporting dogs make likeable, well-rounded companions. Members of the Group include pointers, retrievers, setters and spaniels. Remarkable for their instincts in water and woods, many of these breeds actively continue to participate in hunting and other field activities. Potential owners of Sporting dogs need to realize that most require regular, invigorating exercise. Hound Group – Most hounds share the common ancestral trait of being used for hunting. Some use acute scenting powers to follow a trail. Others demonstrate a phenomenal gift of stamina as they relentlessly run down quarry. Beyond this, however, generalizations about hounds are hard to come by, since the Group encompasses quite a diverse lot. There are Pharaoh Hounds, Norwegian Elkhounds, Afghans and Beagles, among others. Some hounds share the distinct ability to produce a unique sound known as baying. You’d best sample this sound before you decide to get a hound of your own to be sure it’s your cup of tea. Working Group – Dogs of the Working Group were bred to perform such jobs as guarding property, pulling sleds and performing water rescues. They have been invaluable assets to man throughout the ages. The Doberman Pinscher, Siberian Husky and Great Dane are included in this Group, to name just a few. Quick to learn, these intelligent, capable animals make solid companions. Their considerable dimensions and strength alone, however, make many working dogs unsuitable as pets for average families. And again, by virtue of their size alone, these dogs must be properly trained. Terrier Group – People familiar with this Group invariably comment on the distinctive terrier personality. These are feisty, energetic dogs whose sizes range from fairly small, as in the Norfolk, Cairn or West Highland White Terrier, to the grand Airedale Terrier. Terriers typically have little tolerance for other animals, including other dogs. Their ancestors were bred to hunt and kill vermin. Many continue to project the attitude that they’re always eager for a spirited argument. Most terriers have wiry coats that require special grooming known as stripping in order to maintain a characteristic appearance. In general, they make engaging pets, but require owners with the determination to match their dogs’ lively characters. Non-Sporting Group – Non-sporting dogs are a diverse group. Here are sturdy animals with as different personalities and appearances as the Chow Chow, Dalmatian, French Bulldog, and Keeshond. Talk about differences in size, coat, and visage! Some, like the Schipperke and Tibetan Spaniel are uncommon sights in the average neighborhood. Others, however, like the Poodle and Lhasa Apso, have quite a large following. The breeds in the Non-Sporting Group are a varied collection in terms of size, coat, personality and overall appearance. Herding Group – The Herding Group, created in 1983, is the newest AKC classification; its members were formerly members of the Working Group. All breeds share the fabulous ability to control the movement of other animals. A remarkable example is the low-set Corgi, perhaps one foot tall at the shoulders, that can drive a herd of cows many times its size to pasture by leaping and nipping at their heels. The vast majority of Herding dogs, as household pets, never cross paths with a farm animal. Nevertheless, pure instinct prompts many of these dogs to gently herd their owners, especially the children of the family. In general, these intelligent dogs make excellent companions and respond beautifully to training exercises. Step 3 – Now that you’ve taken time to understand the types of purebred dogs, you should take a closer look at the breed you think might be the one that fits your lifestyle. Places to look at for more information is breed club websites, forums, dog shows, breeders, and other owners of the breed you are interested in. You can find a lot of information on well respected all-breed registry websites such as AKC http://www.akc.org CKC http://www.ckc.ca UKC http://www.ukcdogs.com Take some time to look at these websites for lots of great information. After actually taking time to understand what a purebred dog is about, do you still think you want a Rottweiler? Rottweilers are magnificent animals. They have an unmatched intelligence and a deep love for man. The Rottweilers are strong and have an independent spirit. They need training, training, training! You must be willing to formally train your new dog from puppyhood to adult. Formally means going to a dog trainer or class. Rottweilers need socialization right away as babies. As they mature they go through stages just like a kid does…most even had a strong-willed teenager stage! Step 4 – Have you thought about rescue? Rescues have many dogs needing homes that will make wonderful pets. I have rescued dogs and it can be a perfect fit if you get the right dog and all you want is a pet to hang out in the house and keep your feet warm. If you want to do something specific such as a dog sport, it might be more difficult to find the right rescue. All I can tell you is why I purchased my first purebred dog. I wanted a dog that had the genetics and temperament to do the sports I wanted to do with my dog. I wanted an all-around active dog who could pull a cart with me in it, compete in agility trials, earn protection/schutzhund titles, a family dog who I could snuggle with in the evenings, and go running with me in the morning. I owned 3 rescues before deciding to get a well-bred dog. A dog who with healthy parents and generations of healthy dogs behind them was a priority. With much research and soul searching about what I really wanted, I found the perfect breeder who sold me the perfect puppy! Step 5 – Now it’s time to find a puppy at last. Well-bred puppies are not easy to come by. Ethical breeders have few litters and have lists of prospective buyers waiting turn for a chance to own a beautiful standard puppy. You should consider this in your time line for getting a puppy. If you want a well-bred puppy, you most likely will have to wait…sometimes half a year, to a year or more! Beware of unethical breeders and puppy mills! DO NOT BUY A PUPPY FROM A STORE! I can’t say this enough. Stores are the face of puppy mills and puppy brokers. If you cannot look your breeder in the face, then you don’t want to buy from that person. Choice, Quality Puppies and Special, Select “Pick-of-Litter” Puppies from DOBERMAN PINSCHER, GERMAN SHEPHERD, ROTTWEILER WORLD CHAMPION breeding stock are occasionally available. Normally they are 8 to 12wks of age with Heavy Bone Structure, Powerful Head Study, Excellent Temperament and very rich color & markings. Shots-worming-Vet checked & guarantee. ABSOLUTELY GORGEOUS!! Whether you’re looking for the most beautiful pet you have ever owned or prospecting for your next high-level competition dog, let our expertise be of service to you. Why do I consider this ad being from an unethical breeder? First it says puppies available now. An ethical breeder doesn’t breed a dog until they have a list of buyers ready for their puppies. They will advertise well in advance, even 6 months or a year ahead of time. How many litters must I have to offer pick of the litter to every buyer? Lots! There are not many picks of the litter in every litter! This ad has puppies from three different breeds. They state their puppies are from world champion breeding stock. That’s doesn’t tell me a whole lot about their dogs. Anyone can have a world champion if they try hard enough. There are many backyard breeder registries that offer weekend titles for dogs. There are plenty of these breeders around…stay away from them! You might be able to get a puppy from them right away, but long term, these puppies are known to be badly bred. A high percentage of these puppies display temperament problems and short and long term health issues, especially hip dysplasia. If you cannot wait for a puppy and settle on puppies from these breeders, all you are doing is perpetuating a problem. I prefer that people rescue dogs from shelters than to purchase a puppy from one of these resources. At least you would be giving a dog a home that has already been brought into the system, instead of supporting a bad breeder. Good breeders do not sell puppies in stores, by the volume, along with several other breeds, in newspapers, on ‘puppy’ websites, or make outlandish offers like ‘pick of the litter’. Good breeders sell puppies through their own websites, breed clubs, through word of mouth, and referrals from close friends or other breeders or people in the breed. 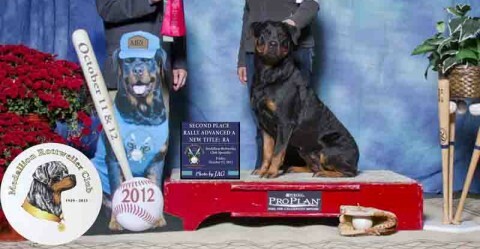 For your first purebred Rottweiler, I suggest that you go to breed club websites and look up the breeders who are listed with the club. These breeders have signed code of ethics with the club. The clubs should have their code of ethics available for you to read. Step 6 – Time to contact the breeder who you are interested in. Don’t be surprised if the breeder wants to know more about you than you think they should know! They may ask about your home life, and they should ask you for references. A good breeder will sell a puppy on contract. They may include ‘first right of refusal’ This means the breeder wants the option to be notified first to take a puppy back if you the buyer can’t keep the puppy anymore for whatever reason. With this clause in the contract, the breeder has the right to be notified first and have the option to take back a puppy before it is sent to live with someone the breeder doesn’t know or approve or, or worse, end up in a shelter. Other clauses in contracts maybe seem inhibitive, but ethical breeders make every attempt to inhibit a buyer from using their puppy from unethical breeding practices. This may be seen in clauses limiting ownership to not allow litters to be registered from ‘pet’ puppies. Puppies sold as pets are usually puppies who are sold to homes that say they are not interested in breeding their pet. When a breeder places a puppy in a home, they are looking to place a puppy in the right home with the right future. A breeder may place a puppy who does not exhibit strong show potential in a pet home. This is because show potential puppies are those that are thought to someday be great breeding potential, which is why a pet puppy most likely will not be a breeding prospect.